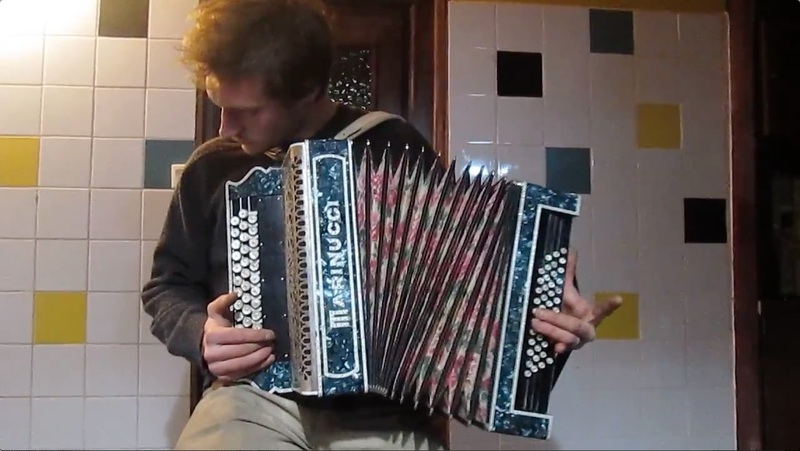 The Corbinola accordion is a self-playing accordion which works from MIDI files and which has a range of 49 notes (2 octaves for bass and 2 octaves for melody). 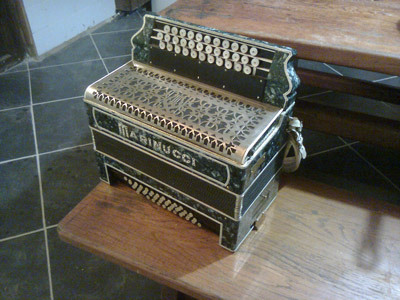 One shown here, the first prototype, was based on Marinucci accordion which was first built in 1934. Contrary to a numerical accordion which as its name indicates it, plays a numerical (or synthesized) sound, Corbinola is an acoustic instrument. We preserve the original reeds to preserve the grain of the instrument, if possible. Your browser doesn't support HTML5 video, you can download it here. The accordion receives a card SD (as certain numerical cameras) which can contain more than 65.000 pieces in MIDI files. Just select a song and the accordion starts to play. You will be able to create your own musics thanks to a musical editor software or to another MIDI instrument. However, only the action of the notes is automatic. The music lover (but not inevitably musician) who uses Corbinola does not have to press on the keys of the accordion but must make use of the bellows to feed the reeds. He's therefore still responsible for the expression and will quickly learn to handle the bellows. 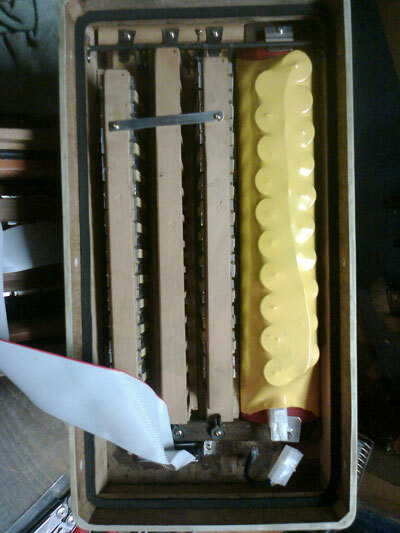 The accordion is powered by an internal battery and can play without any connection. 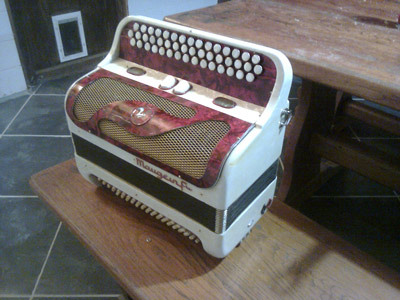 A connector of charge located at the back of the melody keyboard makes it possible to connect your Corbinola accordion and charge the battery. It has an autonomy of about 4 or 5 hours in play. We can study the possibility of transforming your favorite instrument on request. 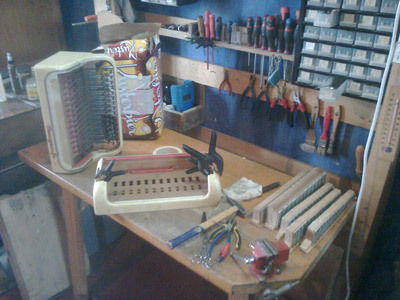 After study, if the manufacture of a Corbinola based on your accordion is possible, an estimate will be provided. We always try to keep a maximum of original features of the instrument (registers, sound, aesthetics) within the limits of possible. 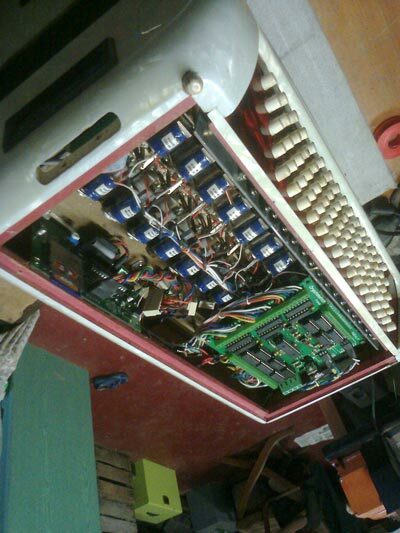 Original accordion is fully disassembled in our workshop to refurbish it and to affix all necessary components that will allow him self-playing. The accordion will read MIDI files (.mid) on the SD card and play the music through solenoids. Each solenoid corresponds to one of the 49 notes of the accordion. Indeed, the automatic accordion has a range limited to 49 ratings. You can create your pieces on computer with a MIDI editor software. It is also possible to record directly from an accordion or other MIDI instrument. 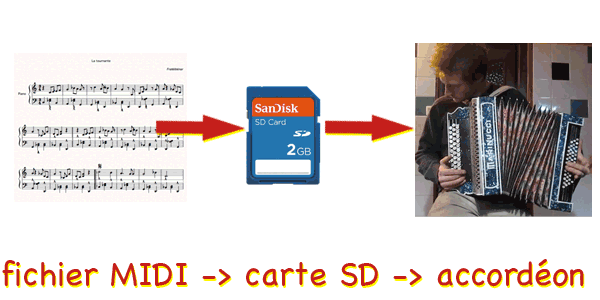 The resulting files will be transfered to the SD card of the accordion to be played immediately.